Looking for a fashionable charity bracelet instead of those rubber charity wristbands? Want to help promote prayer for your favorite charitable cause? Then look no further - Purpose Bracelets are here! 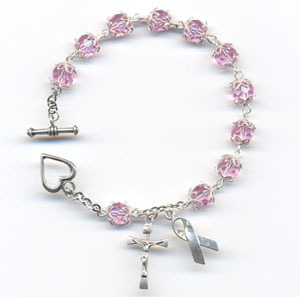 Purpose Bracelets® are sterling silver rosary bracelets handcrafted using Swarovski® components. These unique rosary bracelets are perfect rosary gifts that also increase awareness for rosary prayer and help support charity. For every Purpose bracelet purchased, The Rosary Foundation will donate at least 10% of proceeds to a charity related to your bracelet's purpose. All additional proceeds will go towards helping The Rosary Foundation charity promote the rosary! View our Rosary Bracelet & Purpose Bracelet® Collections. Swarovski Rosary Bracelets to Help Charity! Rosary bracelets have enough rosary beads on them to pray and meditate on one decade of the rosary at a time. When wearing a rosary bracelet, you are constantly reminded to pray the rosary daily. It even becomes more convenient to pray the rosary, because a rosary bracelet can be with you at all times!